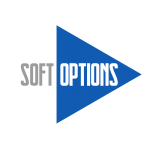 Soft Options (Systems) Ltd (“we”, “us”, “our”) specialise in providing computer solutions designed to fulfil the business needs of its customers. Our skilled consultants deliver cost effective systems to an expanding UK client base ranging from small businesses to corporate and public sector customers. Where we need to collect personal data by law, or under the terms of a contract we have with you and you fail to provide the required data, we may not be able to perform the contract we have or are trying to enter into with you. In this case, we may have to cancel a service you have with us but we will notify you of this at the time. You have the right to withdraw consent to marketing and communications at any time by contacting us. We may use your identity, contact, technical and marketing and communications data to form a view on what products and services we think you may need or be interested in knowing more about. We will only use your personal data for the purposes for which we collected it and will contact you asking for additional permissions if we need to use your data for anything other than that previously agreed. We have implemented appropriate security measures to ensure your personal data is safe and does not get lost or accessed, altered or disclosed in an unauthorised way. We also limit access to your personal data to those employees who have a business need to know. They will only process your personal data on our instructions and are subject to a duty of confidentiality. We have procedures in place to deal with any suspected personal data breaches and will notify you and any applicable regulator of a breach where we are legally required to do so. We will only retain your personal data for as long as necessary to fulfil the purposes we collected it for and to satisfy any legal requirements. You have a number of rights under protection laws in relation to your personal data. For further details please visit the ICO website. You will not have to pay a fee to access your personal data, however, we may charge a reasonable fee or refuse to comply if your request is clearly unfounded, repetitive or excessive. We try to respond to all legitimate requests within one month. This time frame may be exceeded depending on the complexity or number of requests made. If this were the case you would be notified. Lawful basis – Performance of a contract – processing personal data where it is necessary in order for us to provide services to you as agreed in a contract or take steps at your request before entering into such a contract.